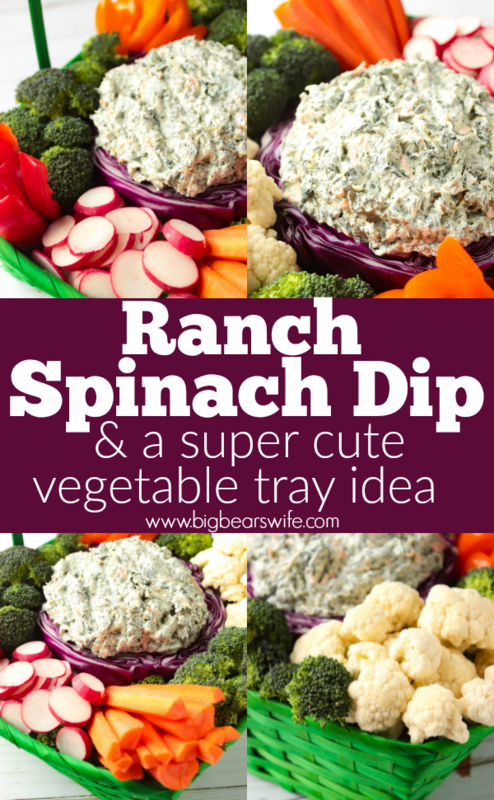 I’m so excited to share this Ranch Spinach Dip and cute vegetable tray idea with y’all. 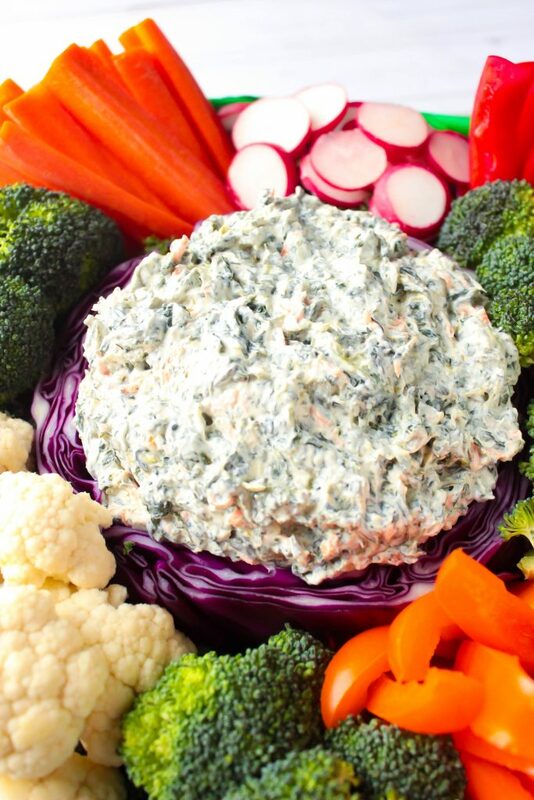 This dip is so tasty and the presentation turns a boring veggie tray into a super cute appetizer! Let’s be honest though, sometimes veggies trays are kind of boring. 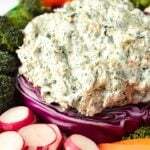 They’re just kind of there on a plastic tray with some kind of dip in the middle with vegetables tossed around it. It’s tasty, but it’s just kinda, ok when it comes to how it looks. 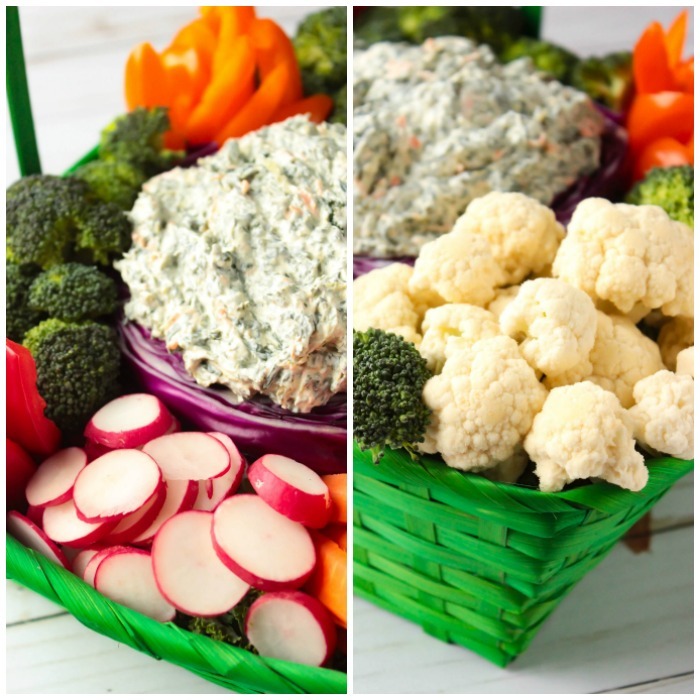 That’s why I was a little overly excited to bring this Ranch Spinach Dip and Veggie basket to Easter this year. It was the cutest! Yes, I made this one right here for Easter but I think that if you put it into a pretty basket (you know, just not an Easter basket) that this would look beautiful at any party. 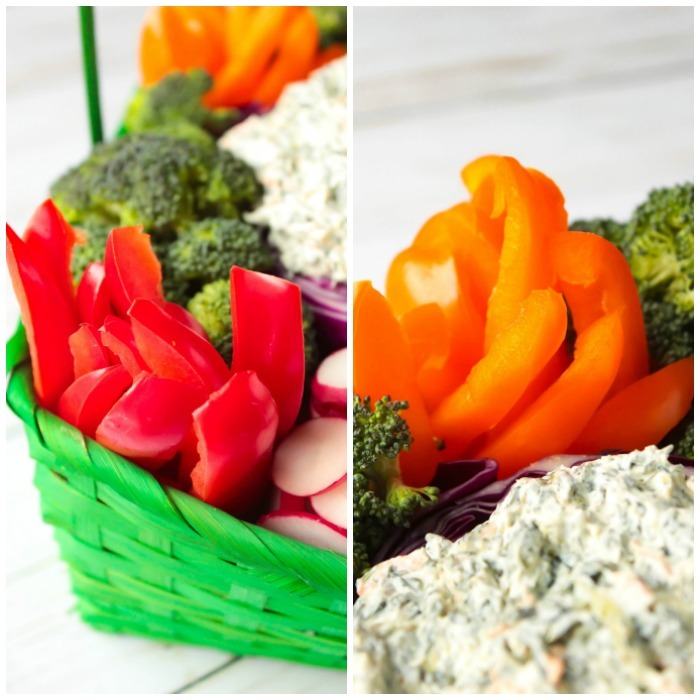 Just think of how pretty a vegetable basket would look at a Mother’s Day lunch! I got this idea from watching an episode of the Pioneer Woman one day when Baby J and I were hanging out around the house. Our TV switches from Food Network to the Disney Channel throughout the day and I just happen to catch her Easter episode and she was putting together a super pretty Easter crudites basket with a spinach dip! 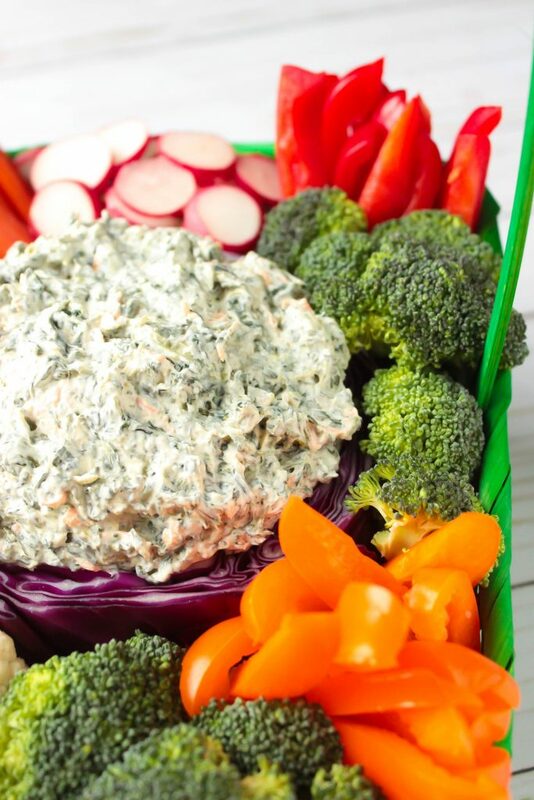 So I decide to make my favorite Ranch Spinach Dip and make a Vegetable tray in a basket for our Easter dinner this year. To serve my Ranch Spinach Dip, Thomas hollowed out a purple cabbage for a bowl! It was the perfect little bowl for the dip. I lined a basket with foil, piled it high with kale and then placed the hollowed out cabbage bowl in the center of the basket. After piling the Ranch Spinach Dip into the cabbage, I added in stacks of vegetables. I added the carrots and peppers into the corners first and then I filled in other spots with some of the other vegetables. 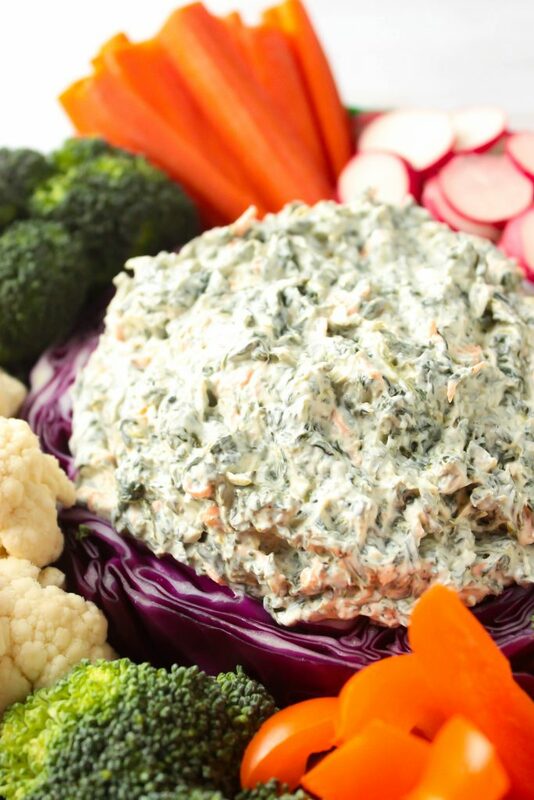 An easy Spinach Dip recipe that's perfect to serve along side carrots, cauliflower, and other raw veggies. I am a sucker for a good dip and your presentation is so much fun. What a great idea to hollow out the cabbage! I think I saw that same episode of Pioneer Woman. I made a variation of one off her recipes for my blog from that episode. -the egg Rice Crispy Treats with chocolate egg surprise except mine is with a mini Cadbury Egg, dipped in chocolate and adorned with M&Ms. Anyway, I love your red cabbage bowl and dip looks divine.